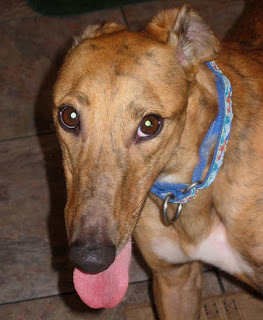 We received a call from Mark Benny yesterday reporting that they lost their greyhound Lucy last week. Mark and Nancy have a home on the eastern shore and Mark was there with their three greyhounds. He let the dogs out while he vacuumed and when he called them to come inside, Lucy did not come in with the other two. Mark did a search of the yard and found Lucy lying down. She could not get up. It was clear that she was paralizyed in her back end. Mark called Nancy and they took Lucy to the local vet. X-rays and an MRI confirmed that Lucy had a severely ruptered disk in her neck. The rupture was serious enough that the vets said that surgery would not be a guarantee at all that it could be repaired and that Lucy would ever walk again. After painful thought, they decided to let her go. Lucy was nine years old. Mark and Nancy were one of the very first families that adopted from us when we first started our group. They adopted four dogs altogether from us. They lost another one of their hounds, Zoe, in 2010. They are very special people. They have always been our most loyal volunteers and family members since the beginning. They have been to so many of our events and have constantly been there when we asked them for help. They are salt of the earth people. They love their greyhounds and we know that they are the best of the best. They are sad to have lost Lucy and we mourn with them. But we know that these people are the type of people who love and cherish and care deeply for their greyhounds. Nancy’s mom has adopted a greyhound from our group too. Lucy had the most wonderful home – the type of home we hope to find for every greyhound we place. We know that Lucy is romping at the Rainbow Bridge looking for all the others and happy to be waiting for her wonderful family to join her.